"Amazing technical instruction. The limited number of skaters and high instructor to student ratio is excellent. Absolutely fantastic in all areas. This is the best camp I have ever seen. Great camp. I have run camps, coached AAA and been involved in numerous hockey initiatives. 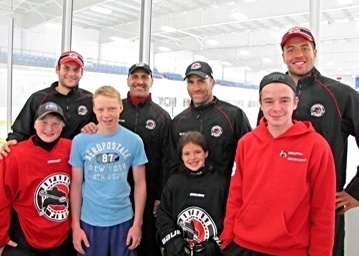 This is the perfect hockey camp for improving overall skill levels. Most importantly, my kids really enjoyed the experience while improving their skills. As a parent I couldn't ask for anything more. We will be back next year!" We at Defence First are excited to introduce the only defensive school of its kind. Defence First will sharpen fundamental skills such as skating, passing, shooting, checking, and puckhandling. But what makes our school uniquely effective, is the time we spend devoted to the mental skills and specialty skills we, as defensive players, have acquired throughout our careers. It is well known throughout the sports world, especially hockey, that “Defence Wins Championships.” Defence First will give defensive players an opportunity to reach their maximum potential and achieve individual success. This in turn will lead to greater contributions toward team success. We will accomplish this through on and off-ice instruction, and off-ice discussions, focused on issues such as nutrition, off-ice conditioning, goal setting, work ethic and character. As players progress through each level of hockey, the talent gap becomes more and more narrow. Improving physical skills alone will only allow a player to reach a small portion of his/her potential. The players that truly excel are the players who have developed their mental skills as well as their physical. "We were looking for a defensive camp and we found The Defence Camp"
Whether your goal is to be the best on your team this upcoming season, to play in the NHL, or to simply play the game of hockey with a greater knowledge, “Defence First” will help you reach your goals. We at Defence First are very excited for the chance to work with developing defensive players. We appreciate the opportunity to give back the knowledge that the great game of hockey has so fortunately given to us throughout our careers.